Former Bengals running backs coach Jim Anderson is lending 29-year NFL wisdom to combine prospects. After eight years of preparing players for what he calls this week’s “Underwear Olympics,” trainer Clif Marshall realizes the NFL draft process has delicate dance partners. There is the brute reality of the prospect’s college tape. Meanwhile, the NFL Scouting Combine that opens Wednesday in Indianapolis supplies sheer data that is seductive and dangerous eye candy for scouts. The Bengals will tell you the tape of past performance on the field rules the day by as much as 60 to 75 percent when it comes to ranking players. Maybe more. And they’re not alone. So Marshall knows combine training has to have a balance. One of his prospects once shattered an all-time combine record for every position and ended up on five practice squads. That’s why this year he welcomed former Bengals running backs coach Jim Anderson to his stable at the Cincinnati-based Ignition APG workout center in Mason, Ohio. 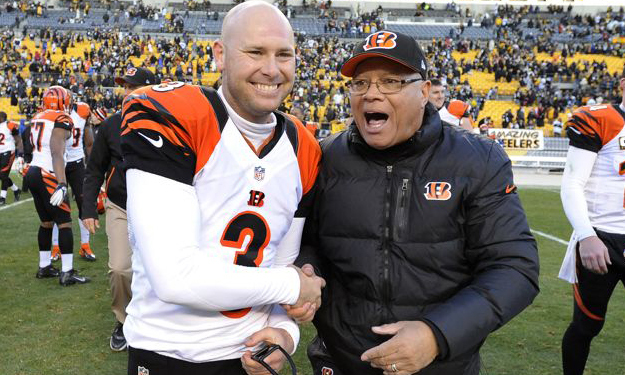 Anderson saw it all in his 29 seasons with the Bengals, a historic stretch spanning the 1984 trade for James Brooks and the 2013 scouting of Giovani Bernard. He watched the combine grow from a mass, Army-like physical to a choreographed event. Marshall covets the advice he gives not only to his prospects, but to him. The Bengals will tell you the biggest function of the combine is medical. It’s the first time the teams get exhaustive physicals on the prospects and while a guy can overcome a poor 40-yard dash time, he can’t beat a bad medical grade. Ignition is proof the maze of combine drills and interviews have helped players get drafted higher. You only have to look at the University of Cincinnati’s Connor Barwin in 2009, when he went from late-rounder to Houston second-rounder to a free-agent killing with the Eagles. Or even last year’s effort by Louisville inside linebacker Preston Brown that lifted him into the third round at Buffalo, where he finished his rookie year among the NFL’s tackling leaders. But numbers can only take you only so far. The University of Cincinnati’s Jason Kelce has started 46 games at center for the Eagles since he came out of the 2011 combine, when he blew up the 20-yard shuttle with 4.1 seconds, a record for O-linemen that was wide-receiver fast. Yet, at 6-3, 280 pounds, he was deemed too small no matter how fast and went in the sixth round. In making tiny Ignition a big player in a combine training field that has mushroomed into a slick cottage industry the past five years, Marshall has had five prospects set combine records in the various drills, ranging from the vertical jump, to the L cone to the 20-yard shuttle. Anderson thinks back to the great backs he scouted and “competitor,” is the word that keeps popping into his mind. He remembers the pro days at the University of Miami that produced Edgerrin James and how the players kept tabs on each other’s times in various drills and vowed to beat their teammates while also supporting them. Corey Dillon, the Bengals’ all-time leading rusher, came out of school early and didn’t go to the combine. But when Anderson worked him out before the draft at the University of Washington, he saw the same kind of ferocity. “He wanted to beat you at tiddylwinks,” Anderson says. Scouts, he says, are also on the look out for sincerity at the combine. Louisville running back Dominique Brown has received Anderson’s message on the field, where Anderson got him before he went to last month’s East-West Shrine Game. He overhauled Brown’s pass-blocking technique and Brown says it’s a big reason he had a strong showing that week. The 235-pound Brown is a bruiser who can catch and has been projected anywhere from mid-range to a free agent. Anderson got to Brown just in time because the pass protection stuff won’t help him at the combine and his upcoming workout on campus for the NFL, known as his pro day. But what will help him at both is the work they do drawing up plays. Brown will be asked to do that often in the next couple of days in Indy. Seven of Marshall’s 17 are headed to Indy this week to do battle against the training conglomerates that have as many as 110 prospects, a third of the combine enrollment. Guys like Brown, out of Winton Woods High School, and Texas linebacker Jordan Hicks, out of Lakota, are local Cincy guys. A guy like Central Florida safety Clayton Geathers has a tie with cousins on the Bengal who work out at Ignition. ACC sack leader Max Valles, a Virginia outside linebacker, must have got the word that Ignition has taken tweeners and made them potential first-rounders. But for the last few years, Marshall has focused on the Operation 53 theme. He said the best moment of the workouts this year so far came when Anderson and Bengals linebacker Vincent Rey arrived and didn’t talk about 4.3 40s, but improving every day so they could make the 53-man roster. He felt that message coming from Rey, an undrafted rookie who became a key member of four straight playoff teams, is particularly powerful.